Narrowleaf Plantain (INCI: Plantago Lanceolata) is a veritable powerhouse of goodies – and not just for skin care. Because of its makeup, this plant has all sorts of beneficial properties that make it equally useful for internal use. I'm still getting to know it, but so far, it's proving to be a very positive acquaintance. Let's look at some of the magic it can do for skin. Looking at the different components of this plant helps explain a bit about why it has so much to offer. Phenylethanoids are good for wound healing. They function as antioxidants and have antimicrobial properties (read: they inhibit the growth of bacteria and fungi). Iridoids function as antibacterial and anti-inflammatory agents (read: they help speed wound healing). Flavinoids are antioxidants. They are also anti-inflammatory and hyaluronidase inhibitors (read: good anti-aging properties). Minerals in this plant include calcium, magnesium, sodium, phosphorous, copper and zinc. Tannins are antisceptic, astringent and anti-inflammatory. Polysaccharides are immuno enhancing (read: strengthen the immune system) and also good for soothing and moisturizing. Saponins are antimicrobial (inhibit bacteria growth) and hemostatic (help stop bleeding). Vitamins A, C, and K are also to be found. With a list like that, you have to wonder why this plant hasn't become a front and center star ingredient in all the major skin care products. (Or maybe it already has and that's what's hiding behind all those smart, made-up, copyrighted names the big-name companies are bandying around in their advertising). 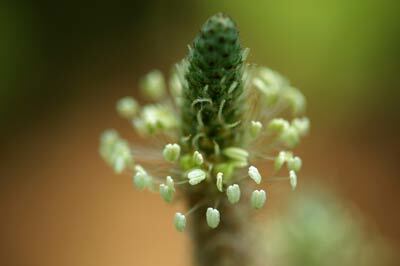 Narrowleaf plantain has a long history of multiple uses, resulting in study and testing of its abilities. Its collagen-stimulating properties are documented. Lab tests (in-vitro) show that the extract has the ability to stimulate collagen I production of fibroblasts by 21% at a very low concentration (0.01%). This data was given to me by my supplier, who in turn received it from the manufacturer. Even though my knee-jerk reaction is to try and find supplemental data (I am still researching), I cannot deny that the other info I have seen on this plant so far echoes similar positive properties. And, while the quest for more documented information continues, I shall rely on the dedication and diligence of my supplier to source from reputable and equally trustworthy manufacturers. (I haven't been down yet). What's Good About Stimulating Collagen Production? In short, narrowleaf plantain is an excellent anti-aging ingredient. Another plus – it's relatively easy to work with. I haven't tried any of these remedies (yet), but have run across them repeatedly while researching this plant. I've been using this ingredient in the form of an extract, made from organically grown Swiss plants. I'm still testing it out and have therefore only used it in Personal Skin Drench & Tonic mixtures so far. It has been behaving well and proving to be quite easy to work with. Have you ever used or heard of this plant before? How have you used it? With all those properties, do you suppose it would work well in a 'normalising' or anti-acne type of cream/serum? Hi, I know this post is very old, but do you think plantain has much to offer in an oil infusion? Are any of the benefits oil soluble? Thanks for all of the info in the post!